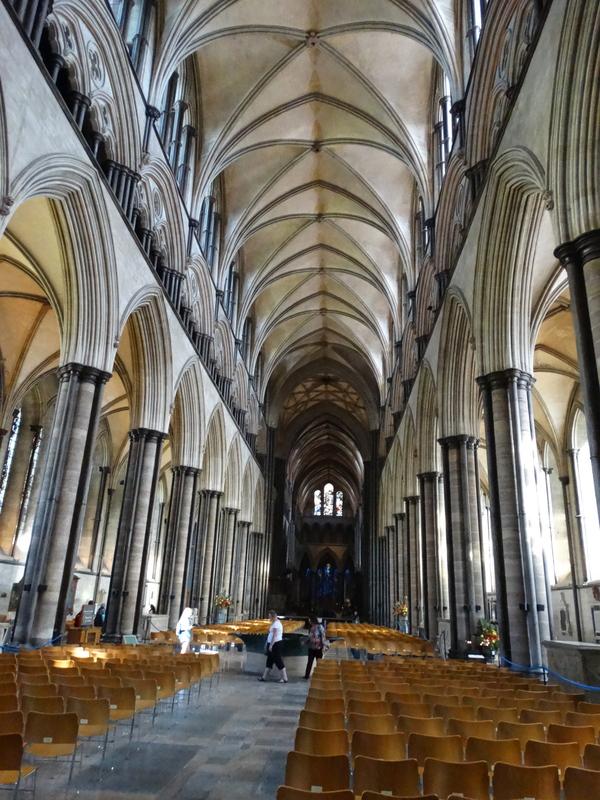 I have mixed memories about Salisbury Cathedral – www.salisburycathedral.org.uk. I last visited ten years ago when Hannah was doing an Eton Choral Course and came and sang Evensong here. It was while Gareth was waiting for his transplant, so a day with mixed emotions. 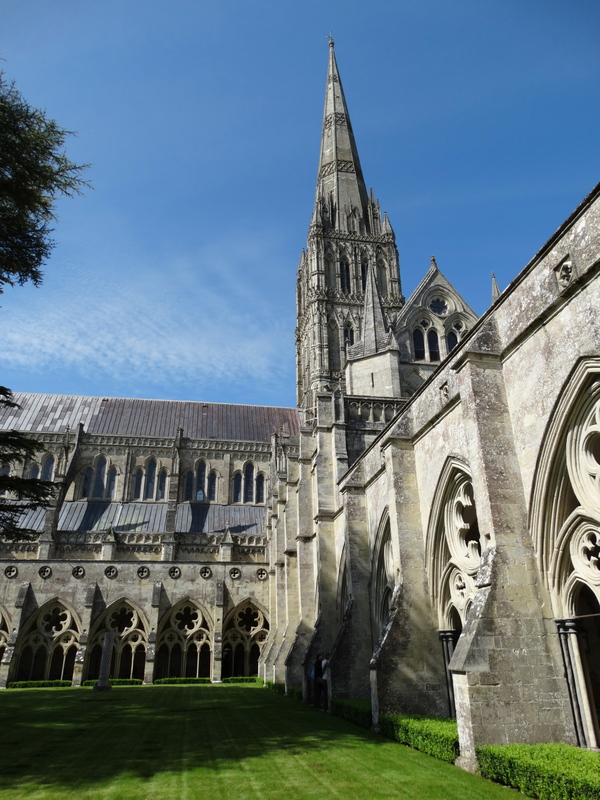 Previously to that I had come to a conference at Salisbury Theological College (now Sarum College) and went across to the Cathedral to book for a Spire Tour. When we gathered for the tour there was only me and the Clerk of Works. He took me to all sorts of places normal members of the public wouldn’t get to – it was great. Julie didn’t think she’d ever been. 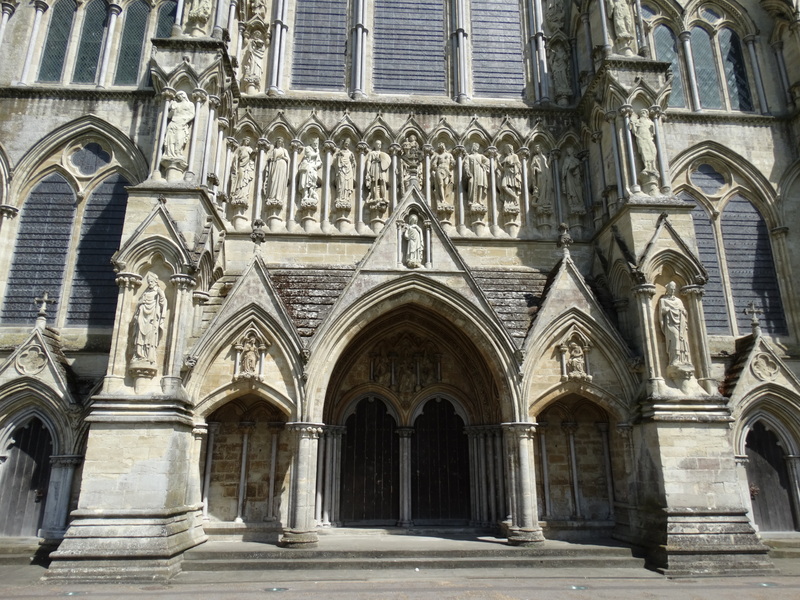 They ask for a (pretty compulsory) donation of £6.50 each – interesting that the entrance is in a south west porch; many Cathedrals let you come into the Nave and then tempt you further! We bought a pocket tour and started exploring. The Pocket Tour starts with “Pride in the Past”. 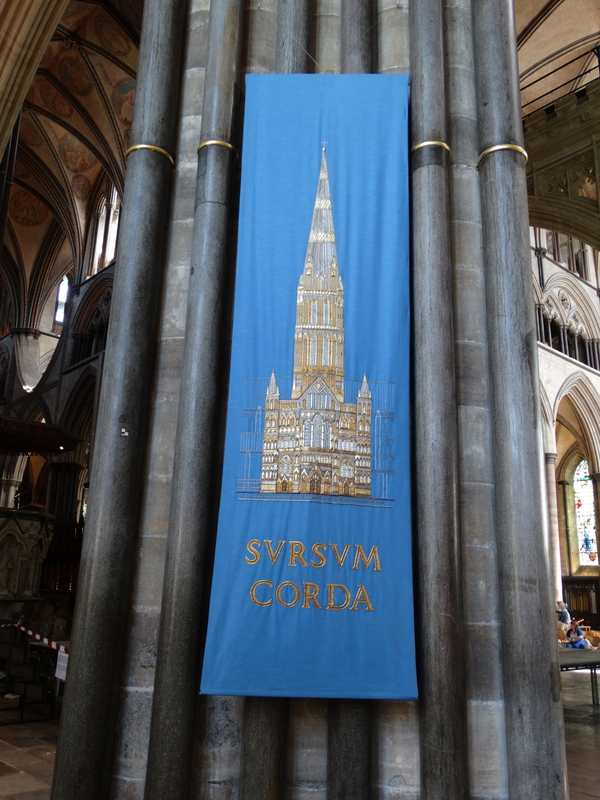 The foundation stone was laid on 28 April 1220, and it was consecrated in 1258. 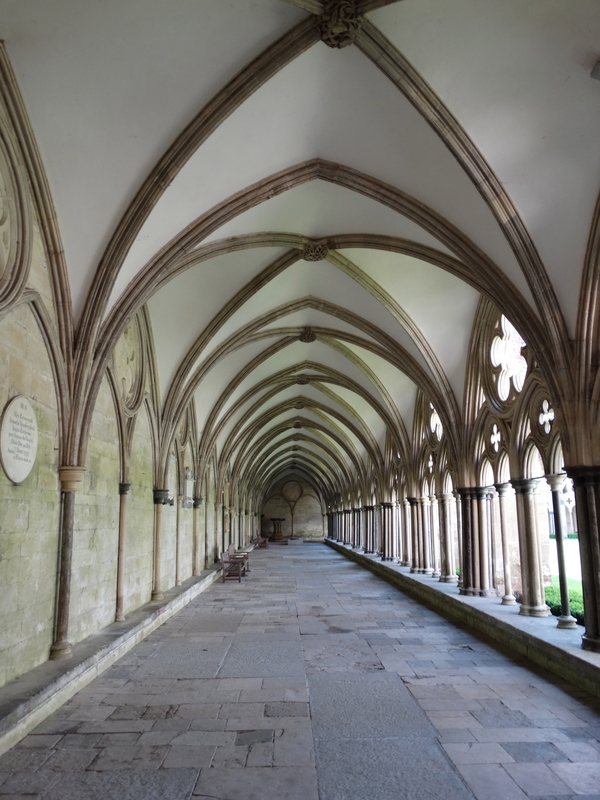 The Chapter House and Cloisters were added in 1266. The 404 foot tower was added between 1310 and 1330. I think I remember John Noakes climbing the spire on Blue Peter, but the website only mentions Helen Skelton’s 2010 climb. 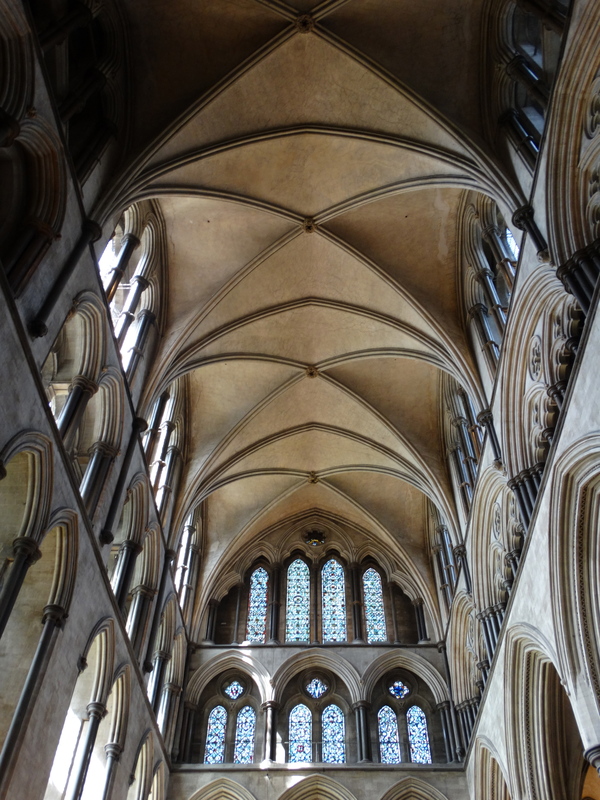 It is a beautiful Early English Gothic cathedral, all of a piece – even though no one saw it from foundation stone to top of spire (something we tend to forget). 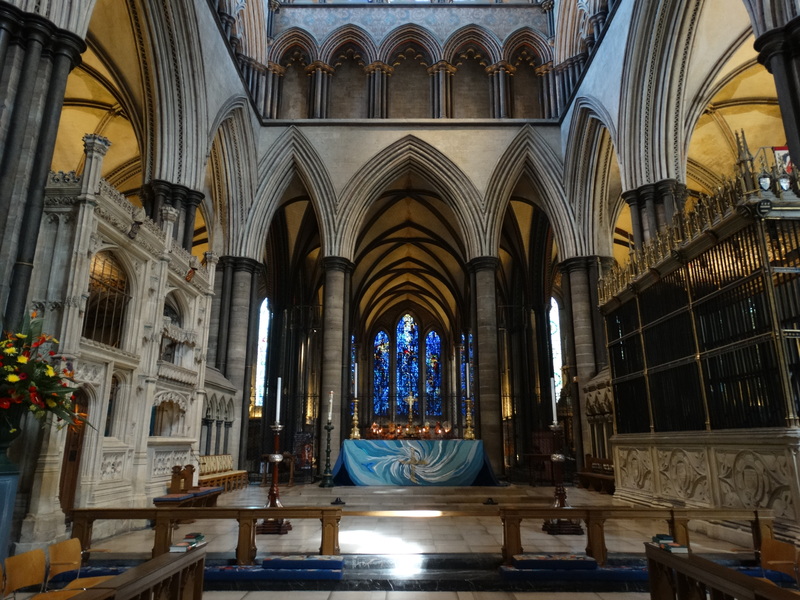 A beautiful Nave, with a wonderful uninterrupted view. 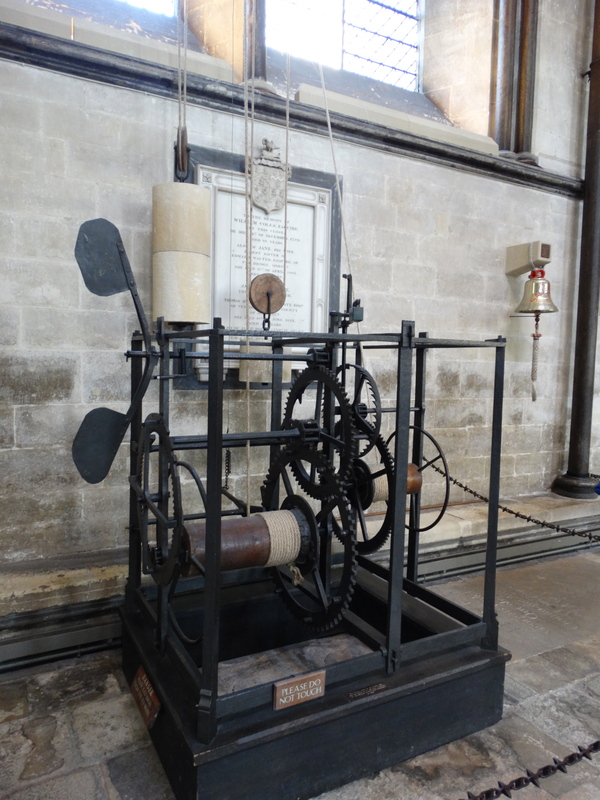 A Medieval Clock in the north aisle, reputedly the oldest working clock in Europe, dating back to 1386. It has no face, and is simply designed to strike the hours. 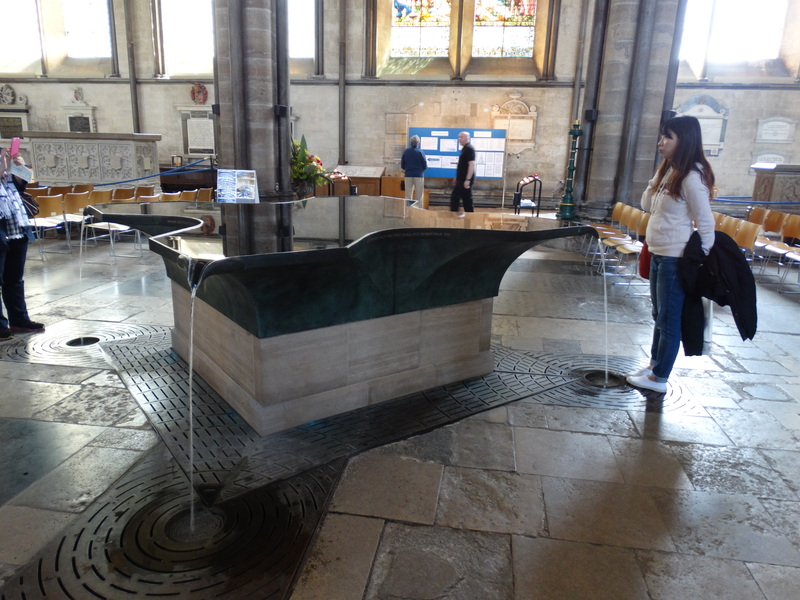 It was originally located in a separate bell tower (demolished 1792) on the north side of the Cathedral. 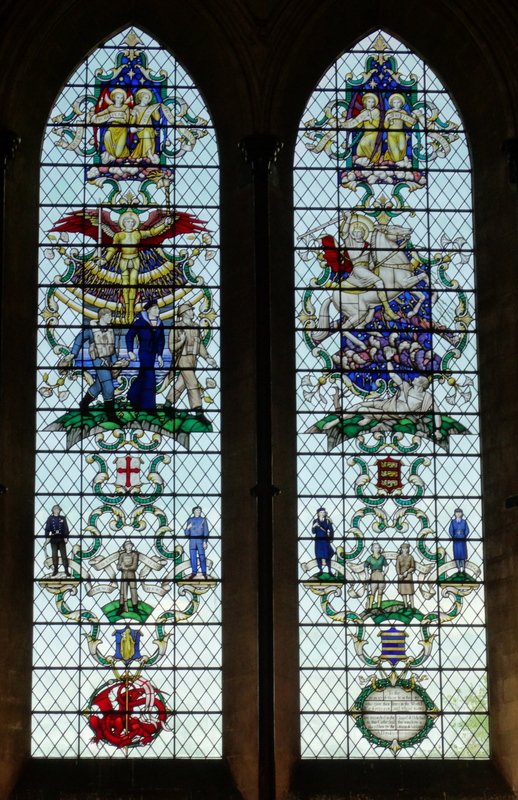 There is a military window and various military flags and memorials in the North Aisle. 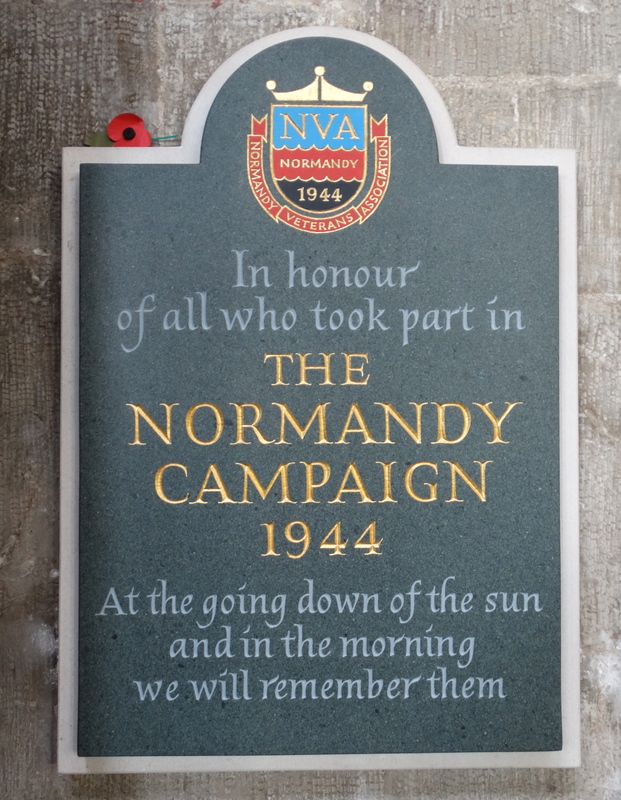 Today (6 June 2014) is the 70th anniversary of D day and we remember them. Julie’s day landed in Europe sometime this month. Ten years ago we were in Guy’s Hospital just after Gareth was first taken ill – his nurse was a German lad! We agreed it was good the world had moved on. 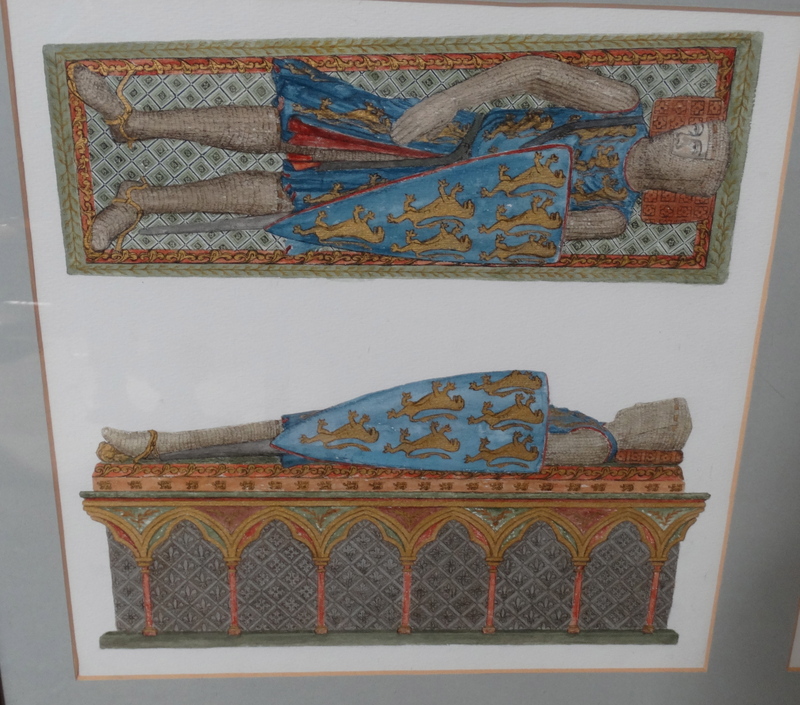 Most tombs are a great deal older – there is Lord Cheney, a supporter of Henry Tudor who fought at Bosworth. He was 7 foot tall. 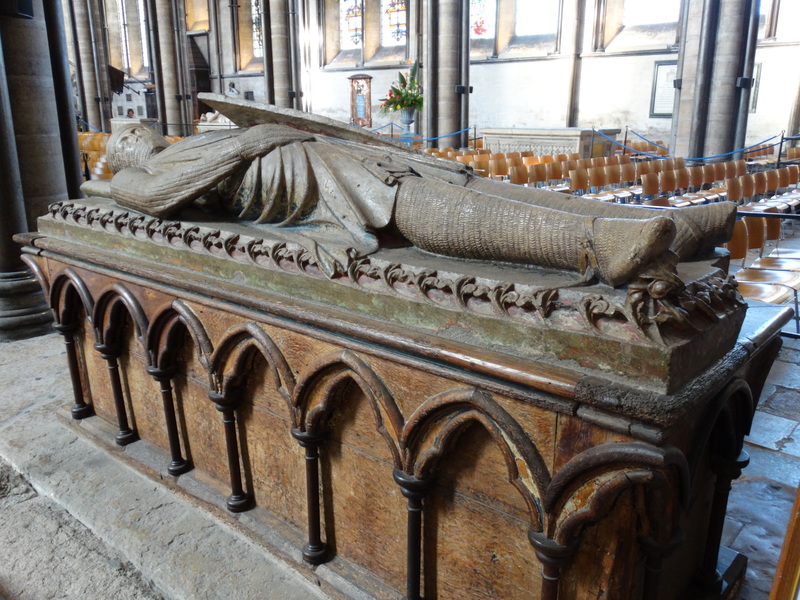 William Longespee, Earl of Salisbury, illegitimate son of Henry II, was present at the laying of the Cathedral foundation stone in 1220. 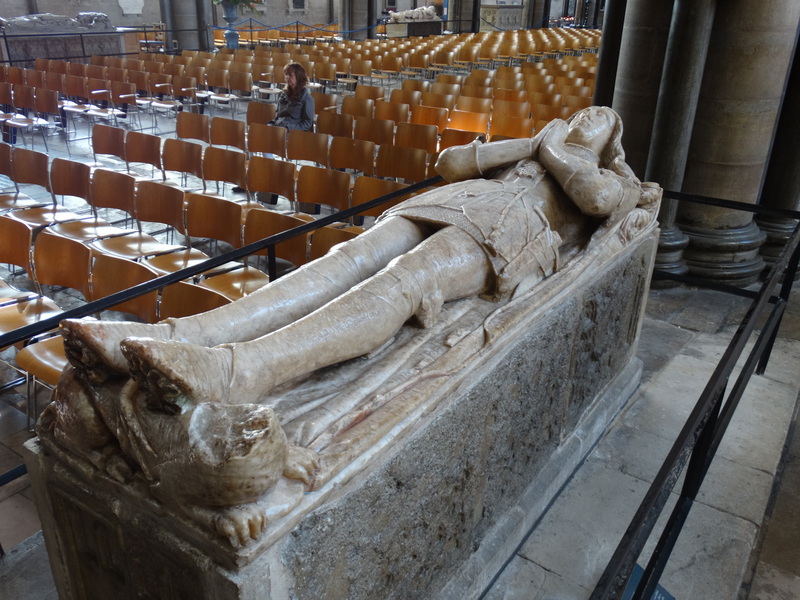 He died in 1226 and was the first person to be buried in the cathedral. Interesting illustration of the colours it was once painted. 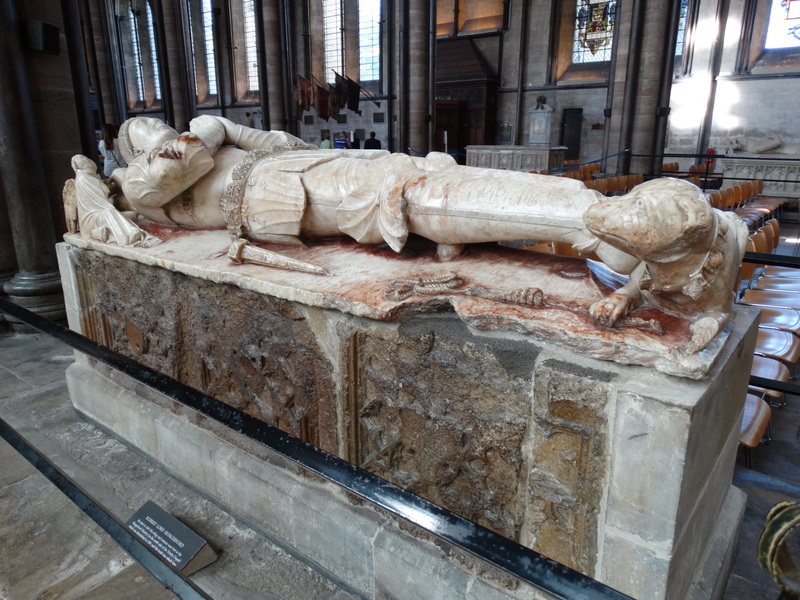 Robert Lord Hungerford, died 1459. 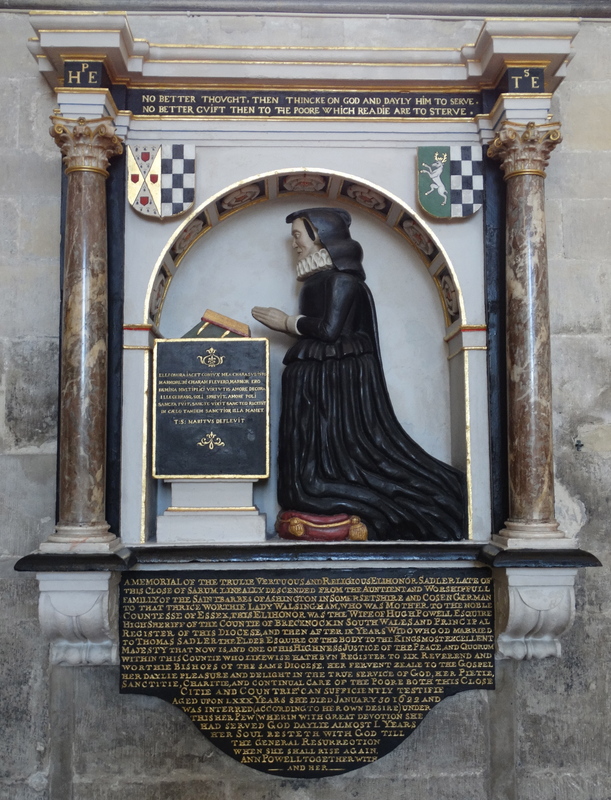 This good lady is Elihonor Sadler, 1622. 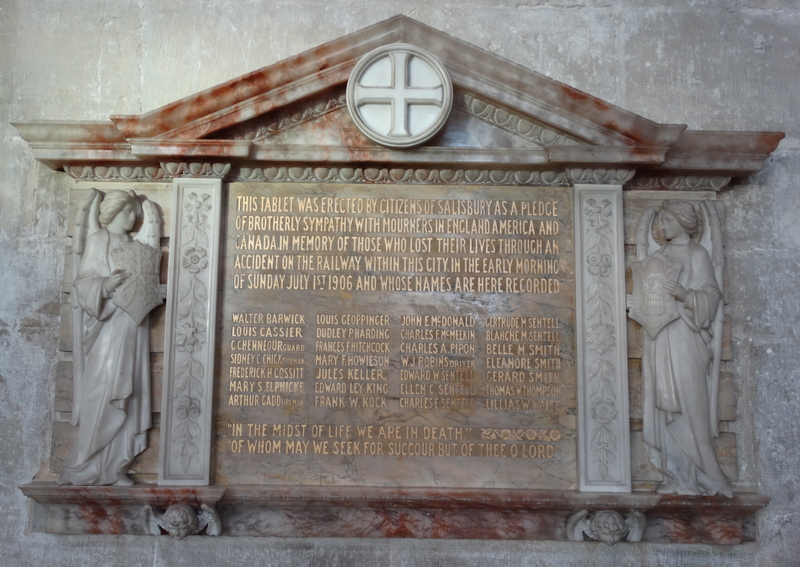 The final memorial on this page is to those who died in the Salisbury Train Crash of 1 July 1906 – website – there is a set of photos on flickr. The train was the Atlantic Liner Express – the GWR and LSWR were competing for the traffic from Plymouth. Drivers had been speeding through Salisbury, and this one came through at twice the 30 mph limit. 28 fatalities, including driver Robins, and 7 injured. 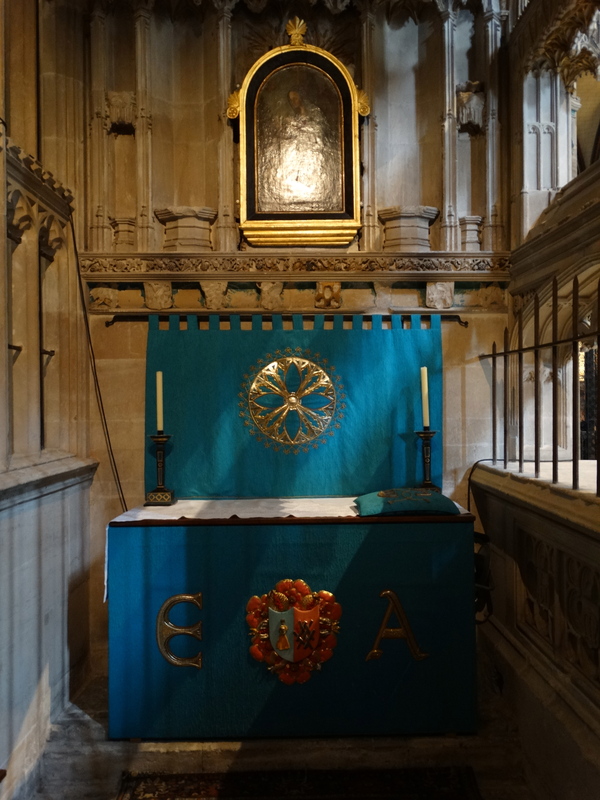 In the North Transept is a rather lovely altar frontal, and a memorial to one of the Hoare’s of Stourhead. 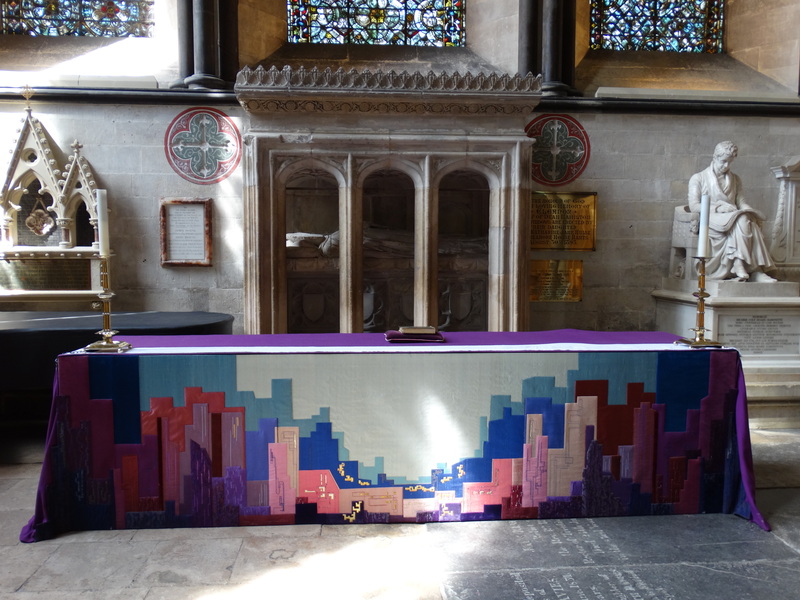 In the Morning Chapel is a memorial to Rex Whistler, painter and illustrator. 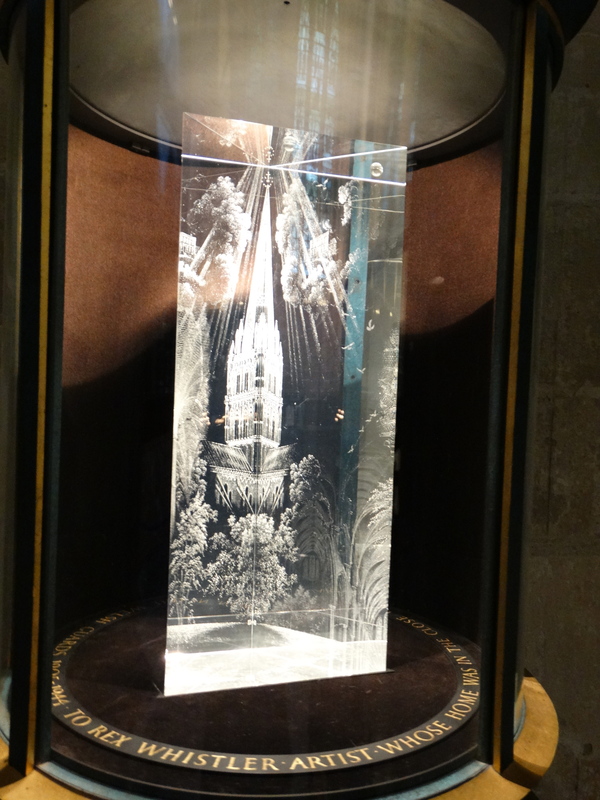 He died in Normandy on 18 July 1944 – this memorial prism is by his brother Laurence. 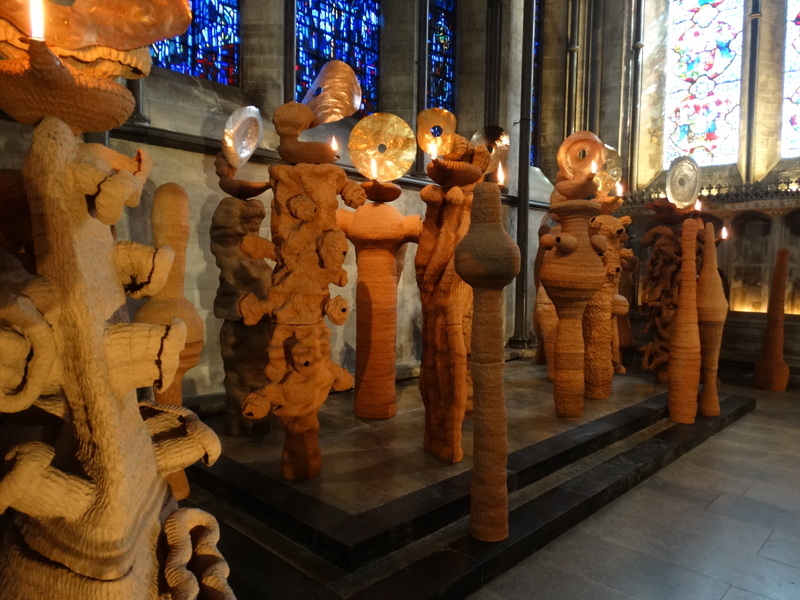 It gives different views of the Cathedral as it turns. 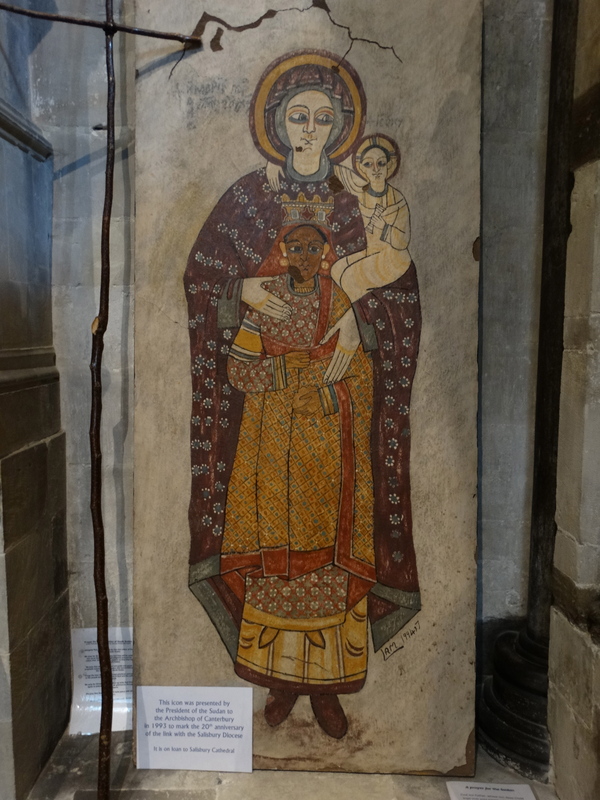 They have placed a painting from their link Diocese of Sudan here, and use it as a focus for prayer – that troubled country needs all the prayer it can get. 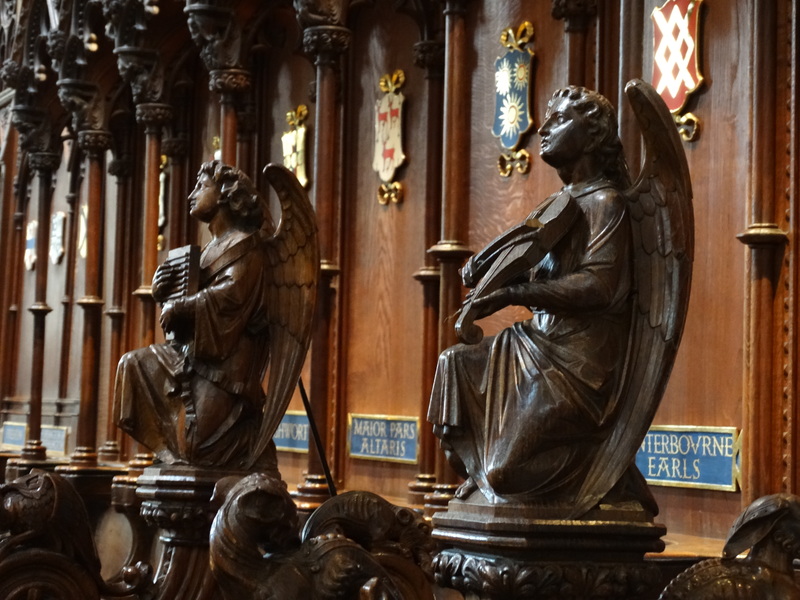 A nice sequence of angels too. 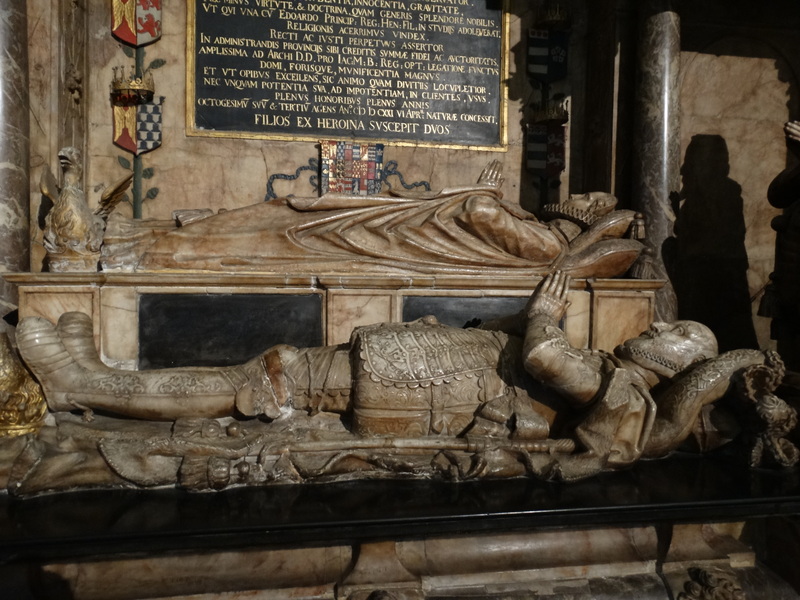 In the North Quire Aisle is the Audley Chantry, but for Bishop Edmund Audley (1502-1525). 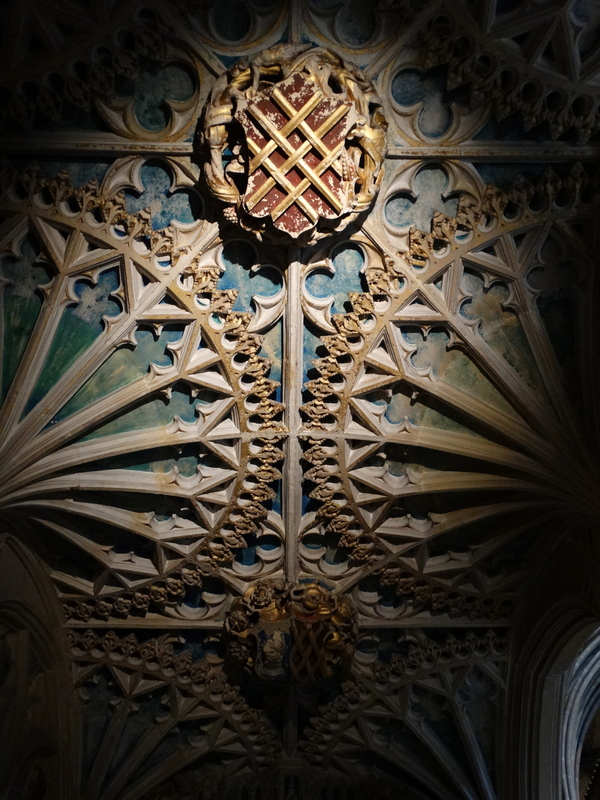 Another beautiful altar frontal and coloured ceiling. 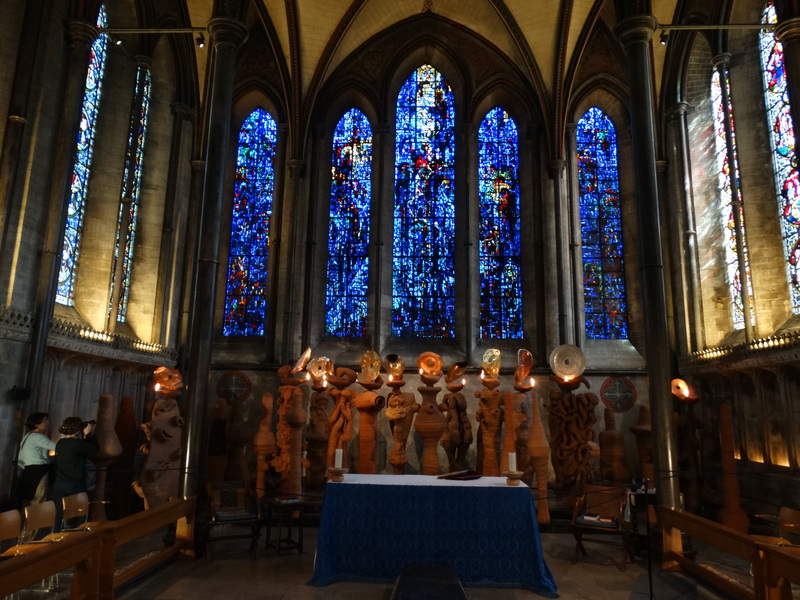 At the East End is the Trinity Chapel, the first part of the Cathedral to be finished – consecrated 1225. 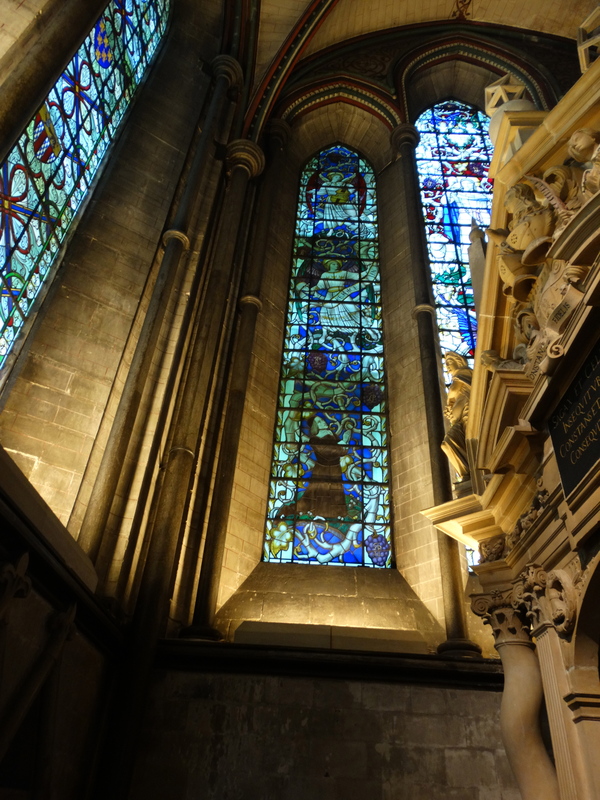 The East Window is the Prisoners of Conscience Window, designed by Gabriel Loire and installed in 1980. 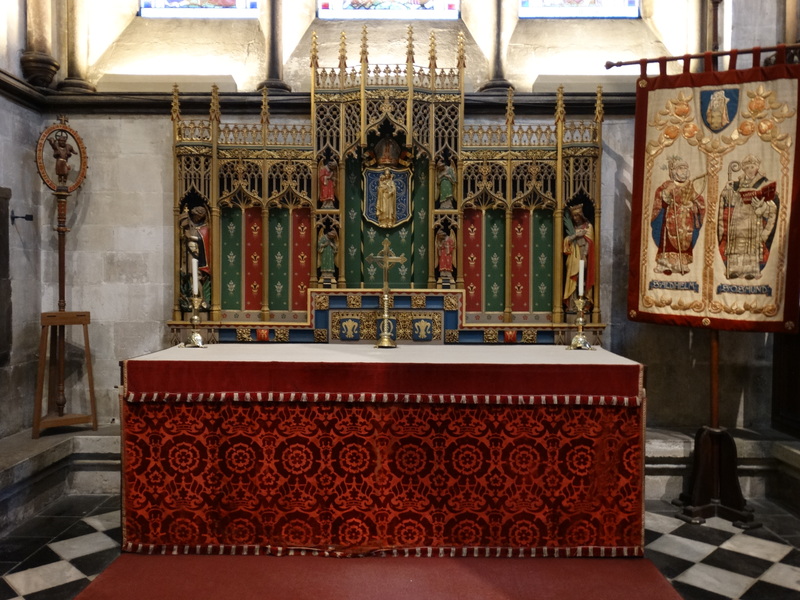 The central section shows Jesus on a dark red cross, with blood dripping from his outstretched arms into two communion chalices (no, I can’t see it either). For me it is a piece of modern art which does not work. 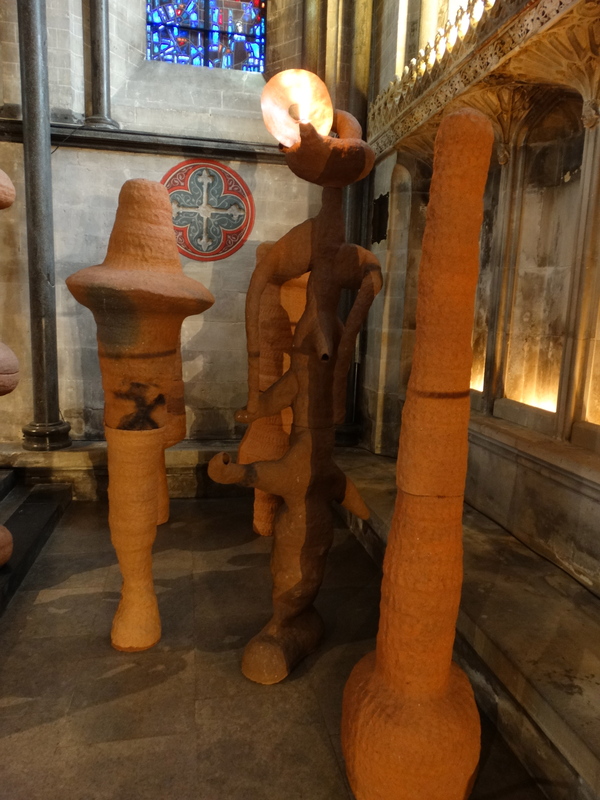 The figures underneath are an installation called “The Apostles speaking in tongues lit by their own lamps” by Nicholas Pope (it is in the Cathedral until 3 August 2014). 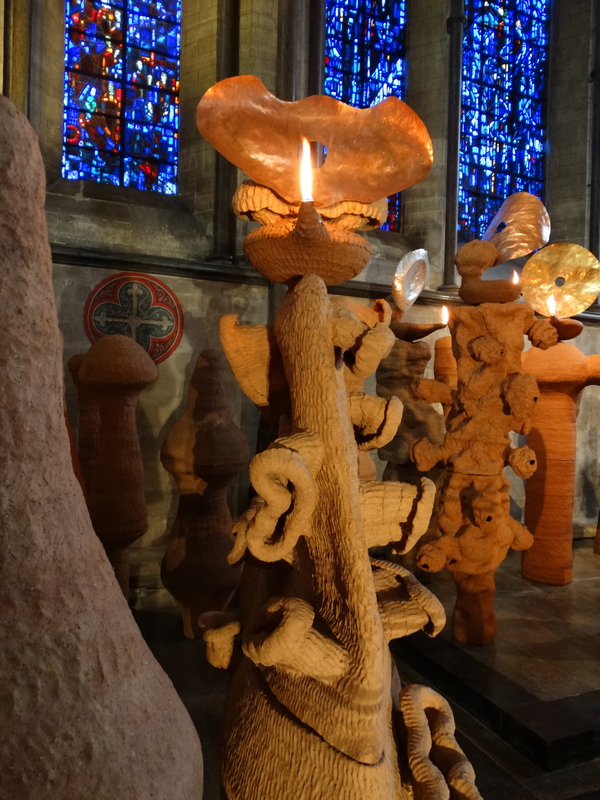 I like the idea of the apostles bringing the light, but I struggle with some of the ways he has pictured disciples – my favourite, Thomas, has “trunk-like bloodsucking appendages”, doubt sucking faith. I don’t see doubts like that – but I do find confidence that it is the doubter who is among the crowds. 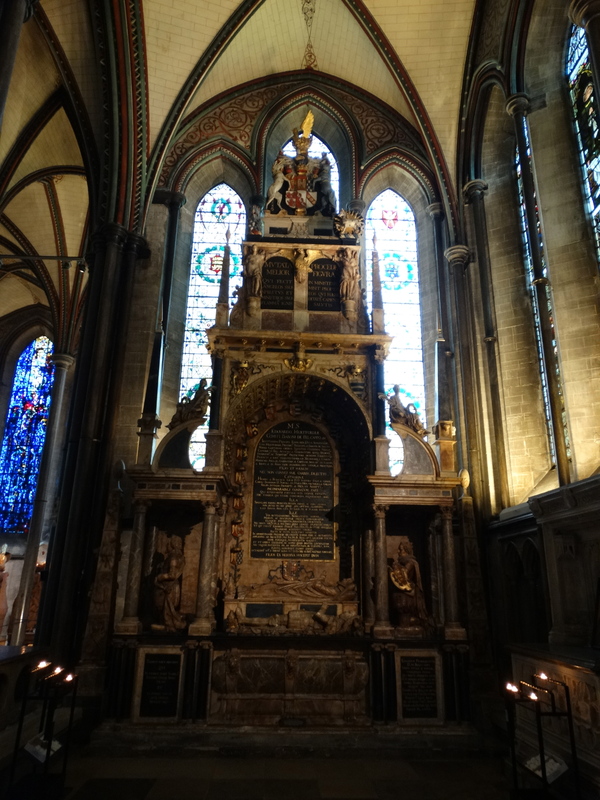 This must be one of the largest tombs I have ever seen. 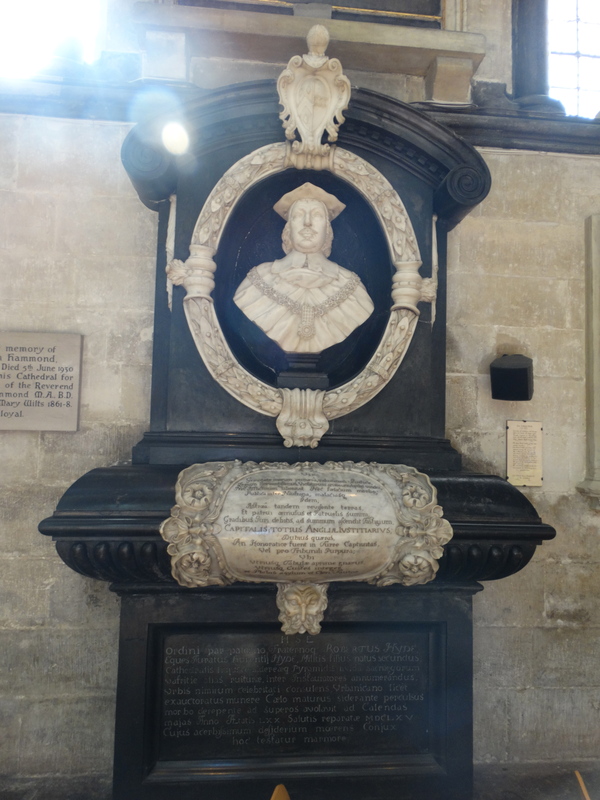 The Hertford Tomb. 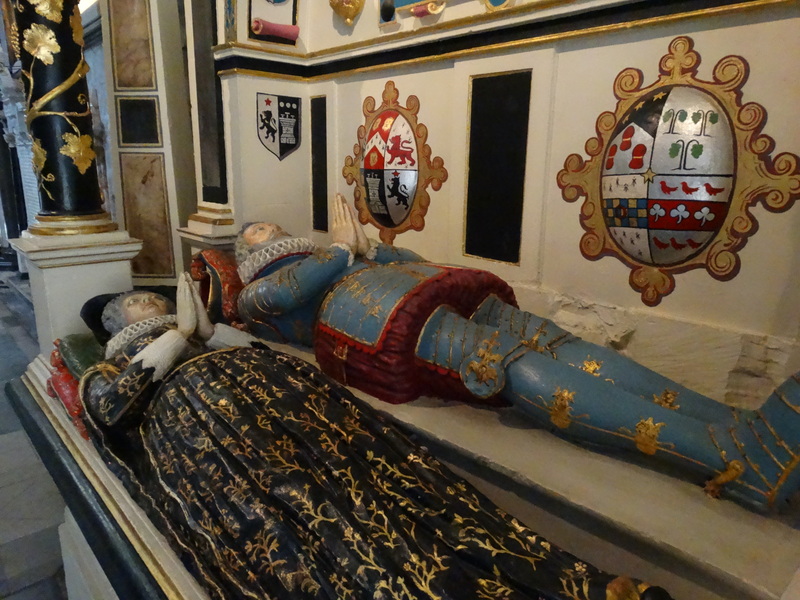 Lady Catherine Grey is positioned higher than her husband, Edward Seymour, because of her family status. Lady Catherine’s sister, Lady Jane Grey, was proclaimed Queen for nine days before being executed in 1554, aged 17. There are some other lovely tombs. 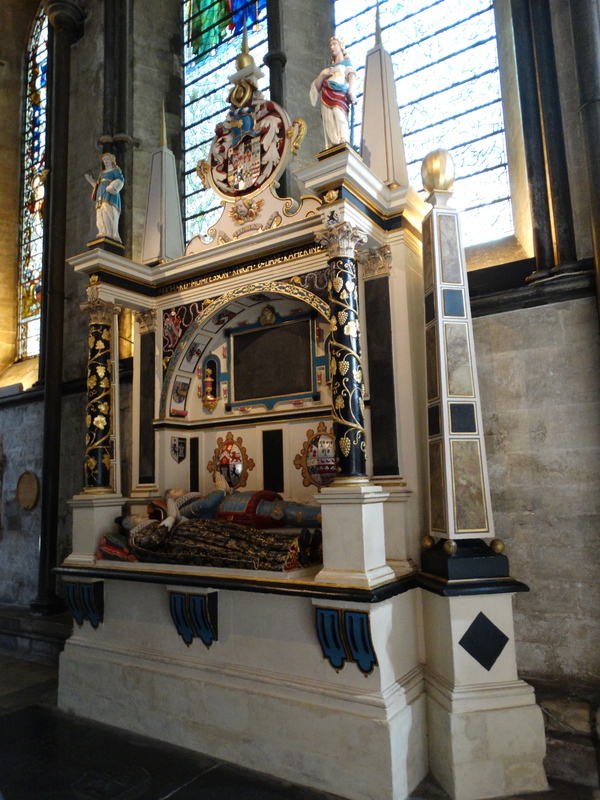 In the South Quire Aisle is this colourful Mompesson Tomb. 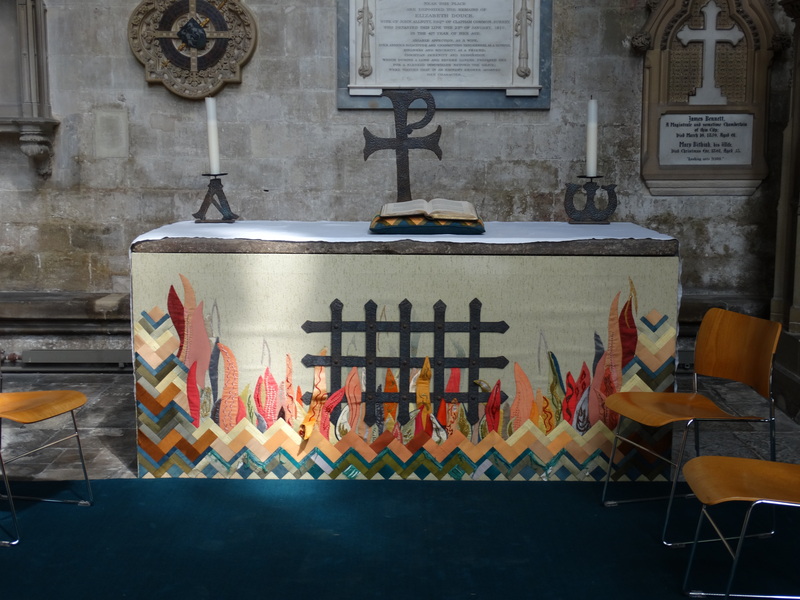 Another lovely altar frontal, but why didn’t I move the chairs? 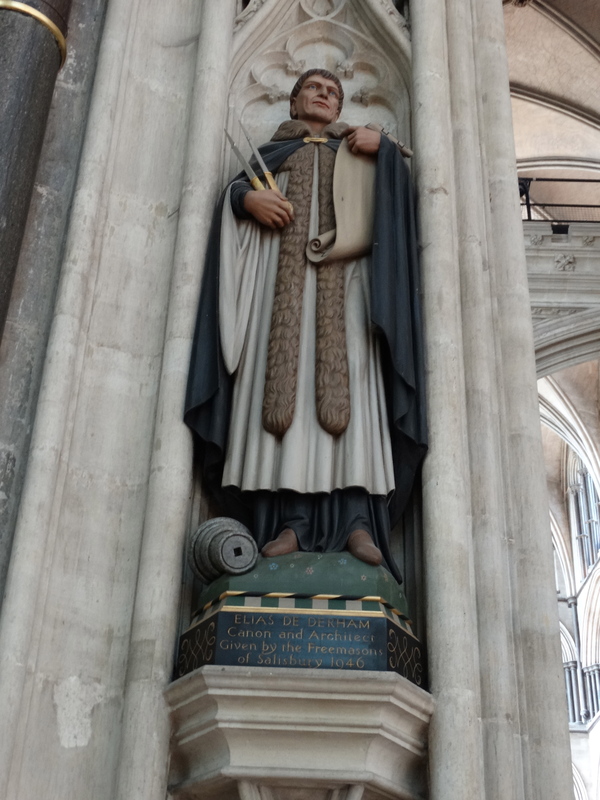 On a pillar in the Nave is this statue of Elias of Dereham, Canon and Architect. 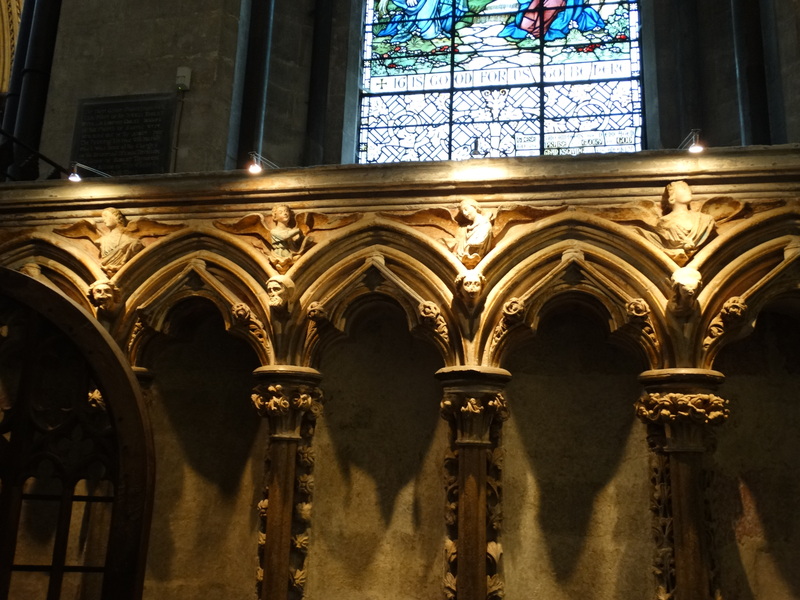 We went into the Quire – the only bit not disabled friendly – where the wooden stalls, dating from 1236, are the earliest quire stalls in England. Some angels are old, others are Victorian. 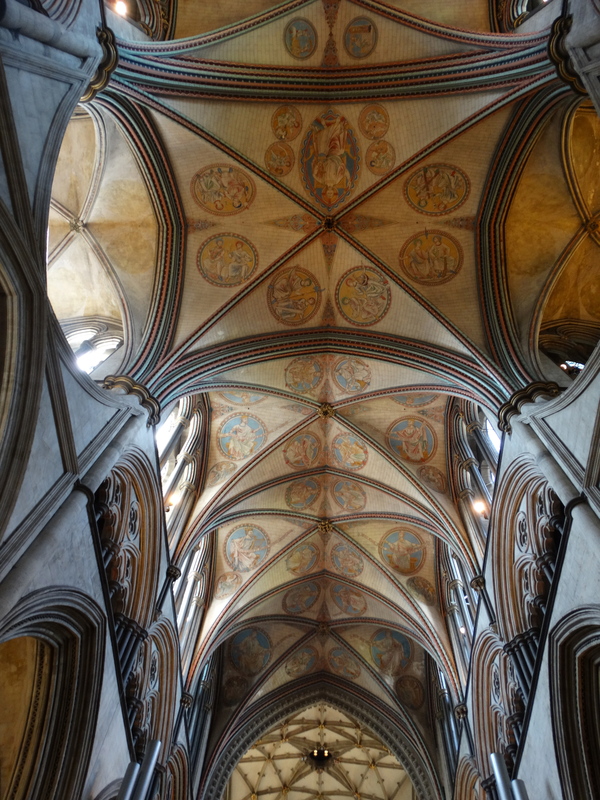 The current vaulting decoration are an attempt by Sir George Gilbert Scott to copy the original medieval design. I would have loved to have stayed on for Evensong, but it starts at 5.30, finishes about 6.25ish, and the last park and ride bus is 6.40. I couldn’t risk it. Talking of music, Julie had seen a statue of George Herbert on the Friends’ Board. 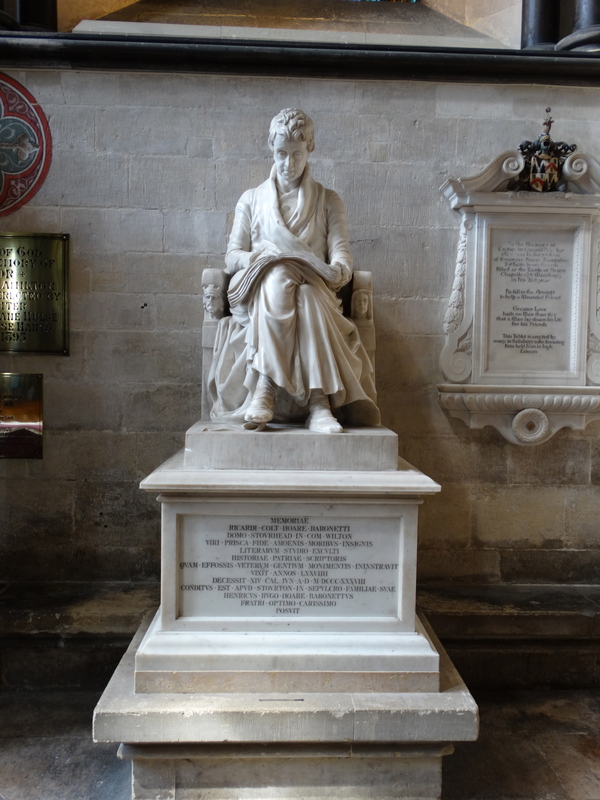 I like George Herbert – and had meant to get to Bemerton, the church just down the road where he served for just a few years. 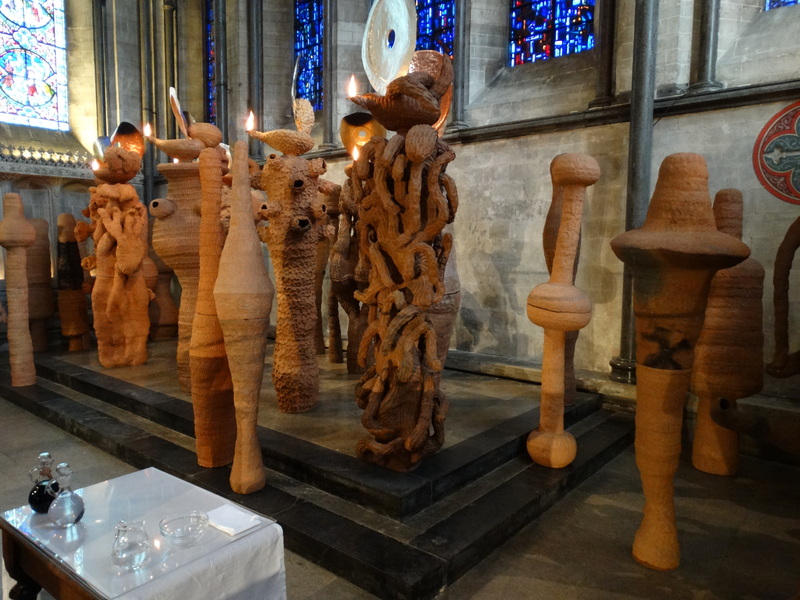 We used his work for Complines in Holy Week – you can find our Booklet and my talks on the Ponteland Church Website – http://www.pontelandstmary.co.uk/news-and-festival/2014-events.html Where is the statue? 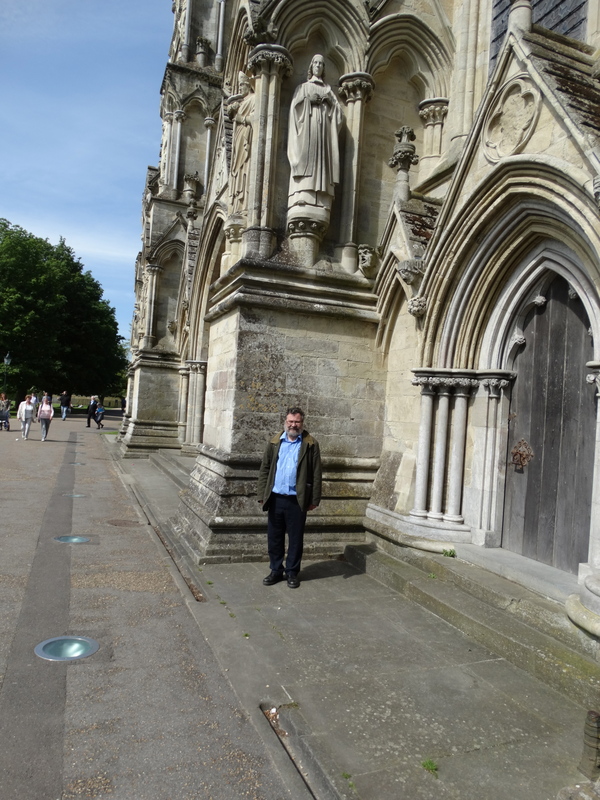 I asked a guide, who took me outside to show me his statue on the West Front. 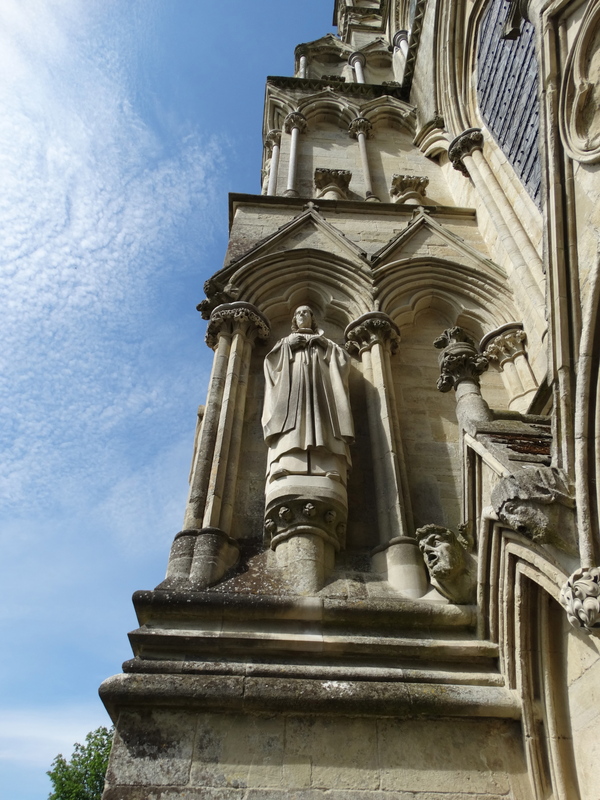 (Some statues are C13, others Victorian, and George was added in 2003). She took my photo too! 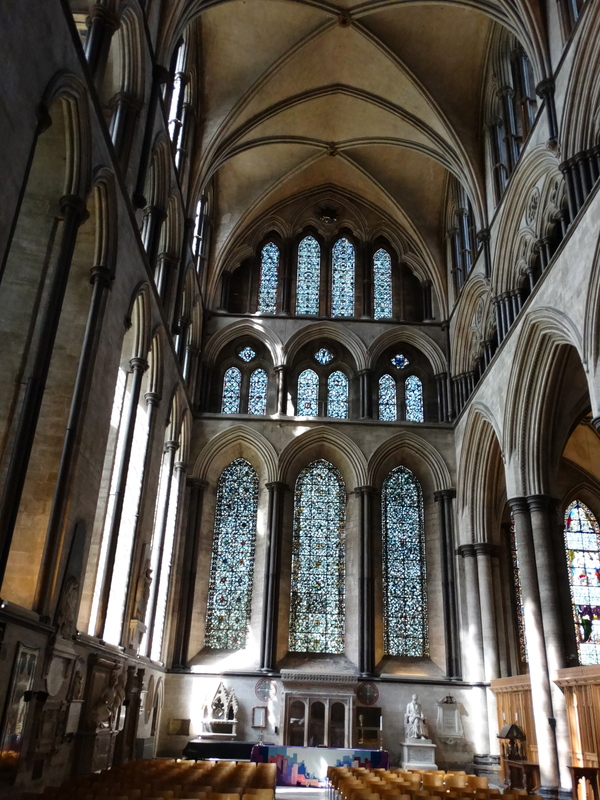 She also told me that he is in the north east window of the North Quire Aisle – we went to find him. 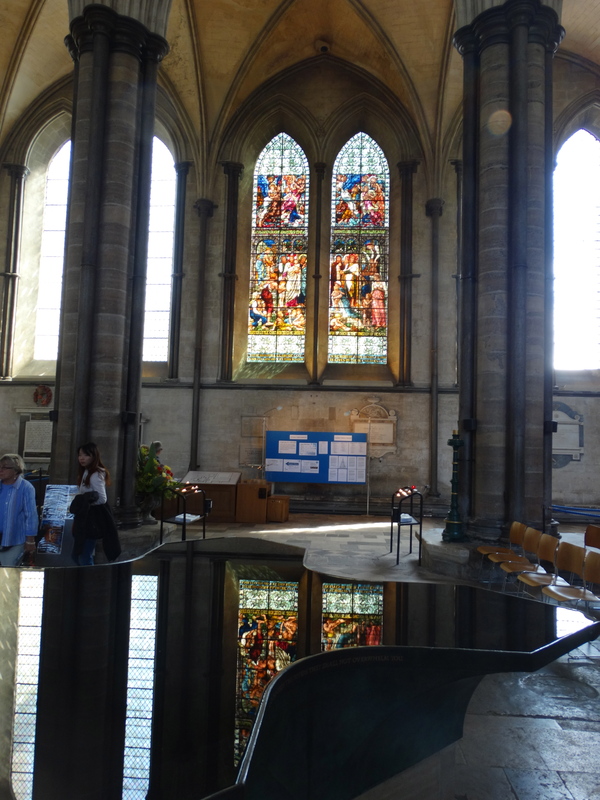 We walked into the Chapter House and saw the Magna Carta (no photography), then ambled round the Cloister. 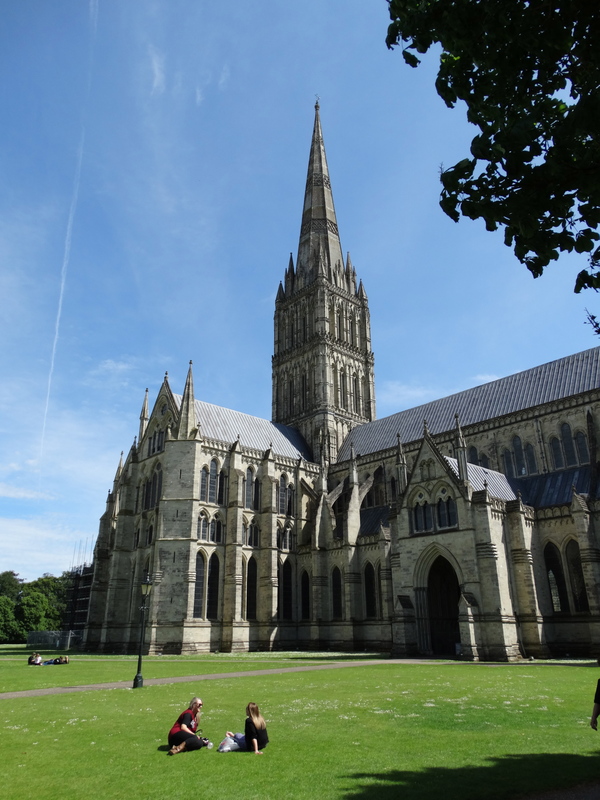 Into the Shop – one book I bought was Focus on the Spire; my adventures as Salisbury Cathedral Photographer, by Joseph Proctor. Quite a fun read about his job – architectural photography, plus anything else that came his way. I think northernvicar should become a photographer, especially now I have a nice new camera. I like Salisbury.